Deciding on what type of camp furniture you should take with you on your camping trip is an important decision. If you're planning to go on a car family camping trip decide if you want to live comfortably or rough it. putting up and taking down. 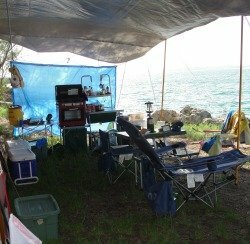 We were there for 3 nights. They bought a small tent for the husband, wife, and child, and an even smaller tent for the mother-in-law. Unless I was going on a survival camp, I would not even have chosen the biggest of the 2 small tents for just myself. They didn't want any of the mattresses that were available and so they slept on the hard ground. When you camp in this manner you tend to not be to fond of camping, and don't tend to look forward to camping again. 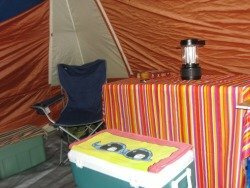 In order to enjoy camping, so that you want to come back soon, bring things that will make living outside comfortable. The basics includes chairs, air mattresses and or cots, tables, and storage units. When looking for camping items I normally go to Amazon so that I can see and read the customer reviews.